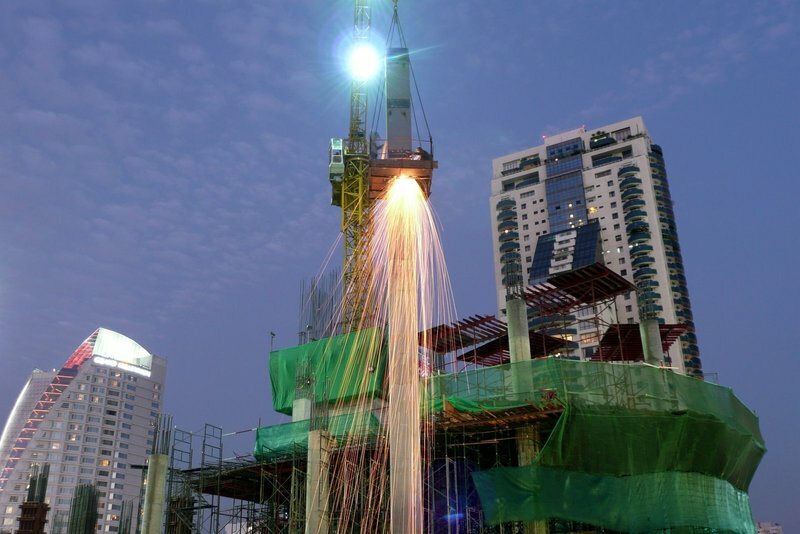 Welding of a column at the Terminal 21 construction project, Sukhumvit and Asoke roads. 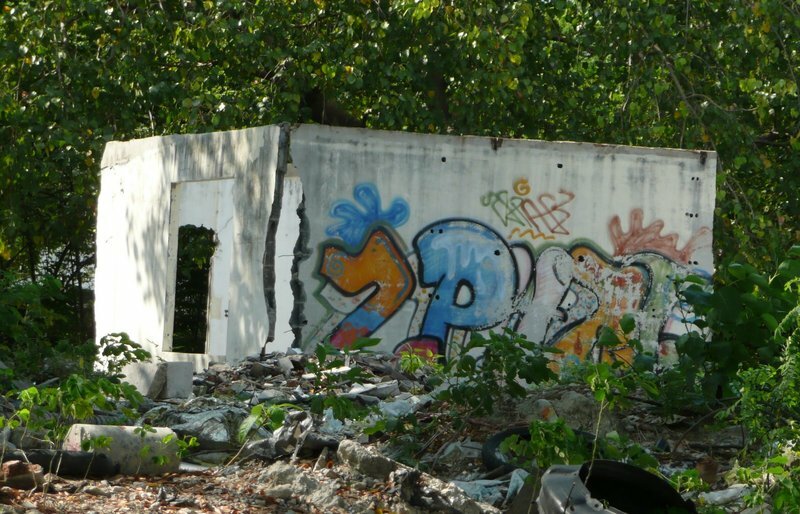 Abandoned structure on an overgrown property, Soi Phrom Phong near Khlong Saen Saeb. 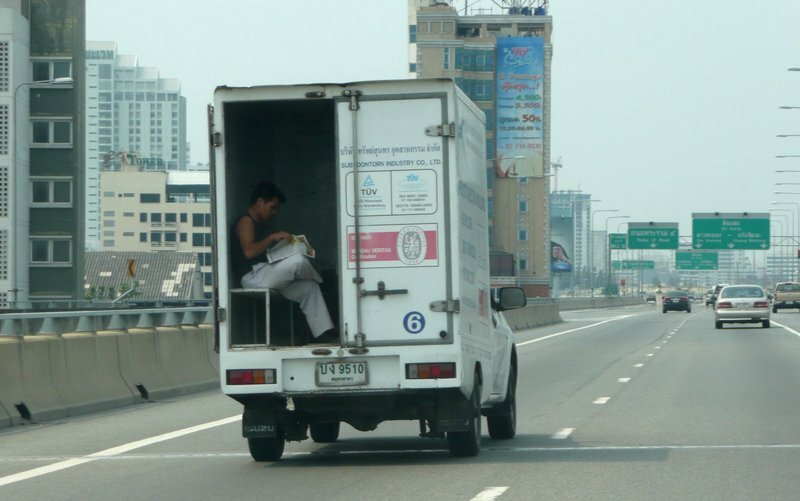 Passenger riding in the back of a delivery truck, Rama IX Expressway near Ekkamai Road. 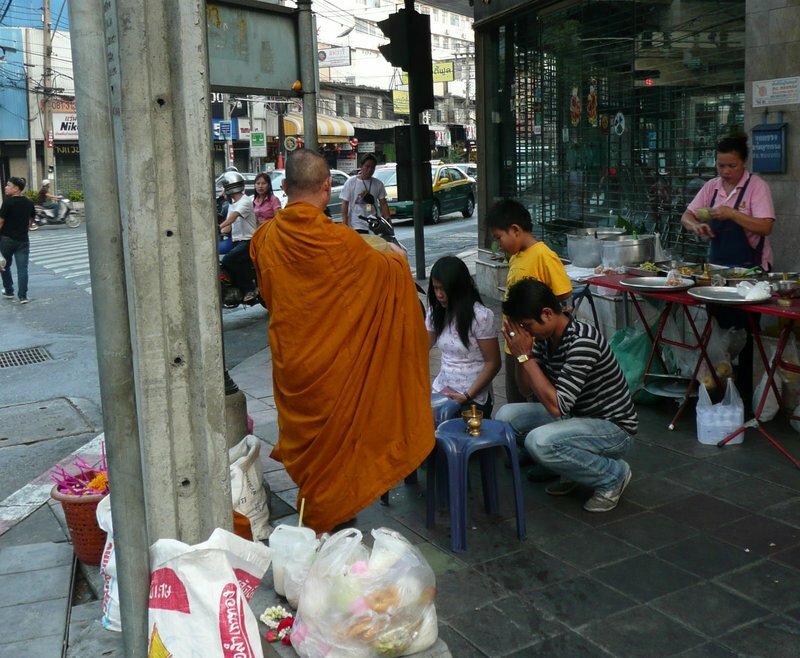 Monk collecting alms and giving blessings in the morning at the corner of Sukhumvit and Thong Lor roads. 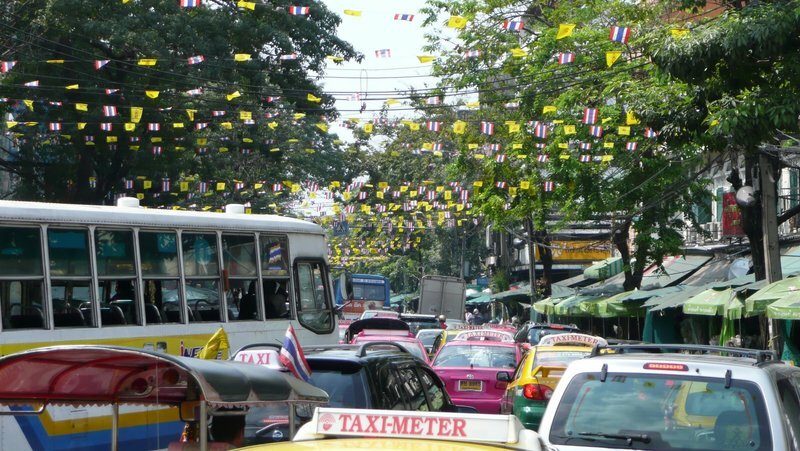 Crowded street near the Flower Market on Rattanakosin Island in the old section of the city. The yellow flags are the flags of King Rama IX. Abandoned cars at a junk yard on the frontage road running along the eastbound train tracks, parallel to Phetchaburi Road. 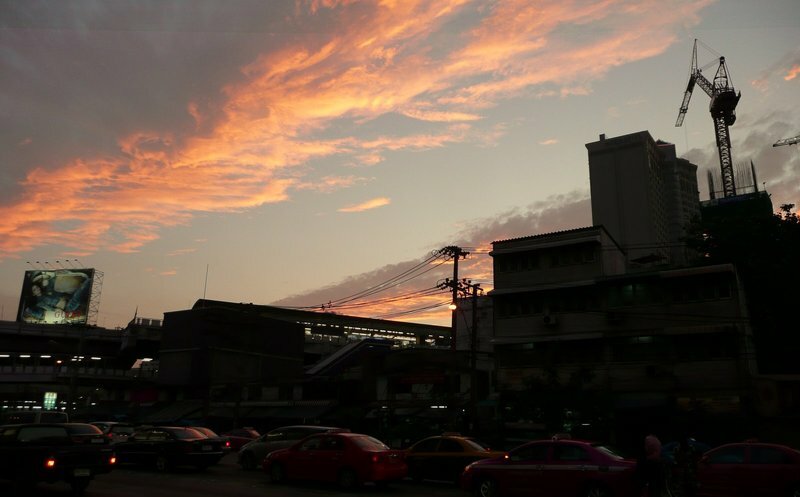 Sunset over Asoke Skytrain Station. This entry was posted in Uncategorized and tagged Bangkok, Krungthep, Photos, Terminal 21 by christao408. Bookmark the permalink. thanks for the pictures. for a split second, i was there. Love these “slice of life” photos. Especially the first and the last. Cool, I especially love the monk on the street corner. That first picture of the welding is fantastic! @Redlegsix – Actually, if the truck stopped suddenly, he would be propelled towards the front of the truck. I’m more concerned if the truck accelerates suddenly. @TheCheshireGrins – I really like that one, too. I went back to the site three times to get the right lighting and the right angle. @decembriel – Yeah, that one didn’t turn out quite as well as I would have liked. I wanted a wider angle so you could see the vendors to the right of the frame. The only way to get that was to stand in the street, which is much too busy! @murisopsis – I’m glad you enjoyed them. @stepaside_loser – And for a splite second, you were. Love these street scape pictures – the first one and the one with the monk are my favorites. I’m curious if people ever notice you or do they simply take it all in stride? Nice. You know what would be nice for your next camera? Built-in GPS! That welding looks like a space ship taking off!Probably escaping from the zombie rampage happened right after the corpse picture was taken from the article in the last post. Nice pictures, especially the welding one. I’m glad the Rama IX Expressway is nicely paved or otherwise the passenger would be enjoying a hell of a ride! Wow, that’s a serious welder.The guy in the back of the delivery truck, goodness. Riding around in the back of a pickup truck bed, fine — but if the truck maneuvers quickly or hits a bump or suddenly accelerates, that guy is going to be on the road getting run over by the next vehicle. Is this a common thing there? Nice snapshots of scenes around the Big Mango. We would love to see more of these in the near future! The first photo is another one of those multi-storied condominium project, I suppose? Love the pictures of the street. The guy riding in the back of the truck with the door open was taking huge chances. But, I have seen this in India. Really digging the welding picture 😀 Jason’s assessment is very accurate hahahaha. Love the photos! They have such a photo-journalistic quality to them. @yang1815 – Don’t think the Lumix LX3 offers that, unfortunately. Maybe if I cave in one of these years and get an iphone@ElusiveWords – Sometimes they do. The monk picture was taken early on a Sunday morning as I was biking, so not only was it attention-grabbing that a farang was taking pictures but he was doing so while astride a bike. @Wangium – Um… speechless. @secade – For the zombie reasons that Jason mentioned? @TheLatinObserver – The toll ways are very modern and nice. I guess you get what you pay for! @arenadi – Is what common? Riding in the back with the door open or getting run over by vehicles? The answer to the first is “no” and the second is “somewhat”. @CurryPuffy – No, the first one is the complex written about in this entry. 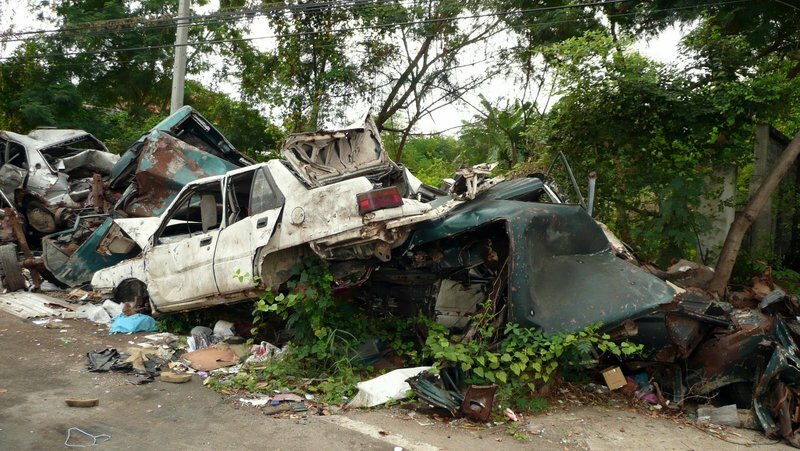 @ZSA_MD – The ties between Thailand and India run deep – and on the expressway, pretty fast. @Rm2046 – Thank you. Wait till I get my new camera! In the past, you could have posted pictures from the moon and they would have had the same effect on me, i.e., and astonished look. Since I have been living in Asia’s Switzerland and visited Krungthep a few times, however, I can actually visualize the real thing. There are just so many odd (to the eyes of an Ang Moh) things here. I like it though. Oh Chris….don’t take my chance to worry away from me with logic…lol. Ok ok….if the truck suddenly accelerated he would be thrown out and run over….at least I have something to worry about!! Amazing. Thank you for sharing your corner of the world. @yang1815 – Already ordered. She’ll be waiting for me in KC. Along with an 18mm wide angle lens attachment. @beowulf222 – I was thinking about that the other day, actually. Having been to a place drastically changes your perception of it, making it both more real but also more surreal at the same time. @styx_site – You’re welcome. I’m glad you liked it. @Redlegsix – Oh, there’s still plenty to worry about in that picture.